How Page Speed Affects SEO - Imagine Monkey, Inc. In a March Mobile First session, Google’s Gary Illyes confirmed that page speed is a ranking factor for mobile SEO. For small to medium businesses, this matters. How fast your page loads affects where it comes up on the list of search engine results. Fast loading pages will compete. Slow loading pages will slide further and further down the list. Here’s what you need to know to stay at the top of the page. Slow loading causes page abandonment. Almost half of web users abandon a site that doesn’t load in two seconds or less. Even a one-second delay, or three seconds of loading, tanks customer satisfaction by as much as 16 percent. 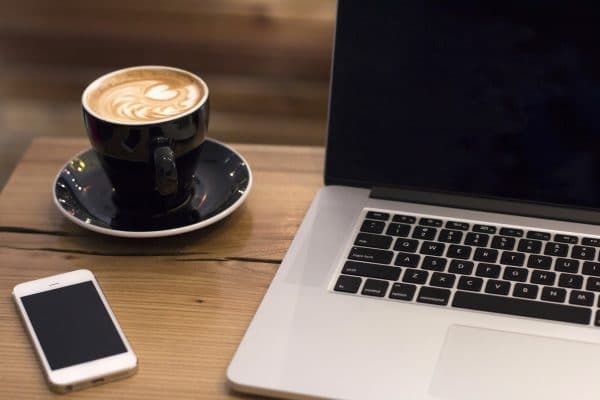 Seventy-nine percent of shoppers who dislike the way a website performs say they won’t try again, and 44 percent say they’ll share their bad experience with friends. If your e-commerce site makes $100,000 each day, one second delays could cost $2.5 million in lost sales. Customers expect pages to load even faster on mobile. A few seconds costs sales and impacts your profits. It pays to analyze your current load times and create a site that loads at top speed. There are several tools available for measuring your page’s load speed. Here are a few of the best options. Google PageSpeed Insights – Enter the URL you want to check and select “analyze.” Google will provide you with a report evaluating speed and user experience. It provides recommendations for speeding up your website with clickable links to further advice. Access high-, medium-, and low-priority solutions to speed up your page. Most suggestions are technical, so it’s smart to have your web developer available to help you choose the ones that will be most effective for you. GTMetrix – Measure load times and receive information from multiple online tools. Type your URL in the box and select “go.” Receive input on each page with feedback on how to improve speed. Why Does Google Prioritize Page Load Time? Originally, Google said page speed would not be a factor, so a site that took 20 seconds to load could still compete with one that loaded almost instantly. Then, Google Vice President Marissa Mayer did an experiment. She asked users if they preferred to see 10 or 30 results in response to a search. Users wanted 30 results, so Google made some changes. Pages showing 30 results received 20 percent less traffic. When Google tested loading times, they found the pages with more results took a half second longer to load. They asked if half a second made that much difference – how much could two or three seconds impact traffic? As it turns out, quite a bit. How Will Page Load Time Affect SEO? Page load speed isn’t the only element that impacts SEO. It’s one of 200 factors that can impact your search engine rankings. Site speed is important but so is the relevance of and content on each page. Google wants to evaluate pages based on usability metrics, so speed is just one factor that contributes to overall customer satisfaction. However, it may be easier to improve page load speed than to continually update keywords and rewrite meta descriptions. While load time is just part of SEO, there are other reasons optimizing your site should be top priority. For every second your time improves, you improve user experience and build trust. Not only will users browse through all your business offers, they’re more likely to convert and to tell their friends about their positive experiences. 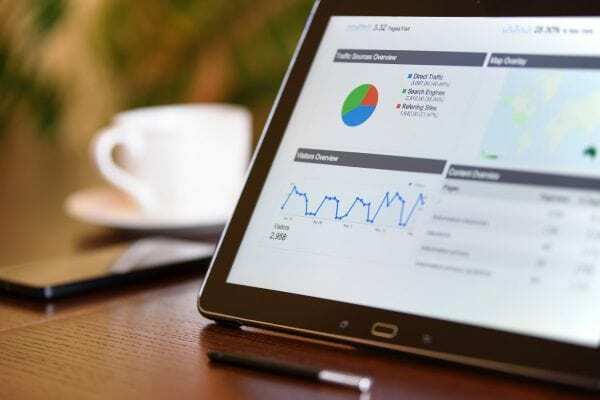 How they interact with and review your site significantly impacts your ranking with search engines. A new analysis says the average time it takes for mobile landing pages to load is 22 seconds. Shoppers expect mobile to be even faster than desktop, so, if they experience long wait times, they’ll abandon searches and shopping carts. They want banking sites to let them pay their bills in seconds, travel sites to give them instant photos and reviews, and articles to load on-the-spot. The analysis showed bounce rates increased 32 percent when mobile pages went from one to three seconds. If the page took five seconds, bounce rates skyrocketed to 90 percent. Search engines reward sites with better performance with higher rankings. 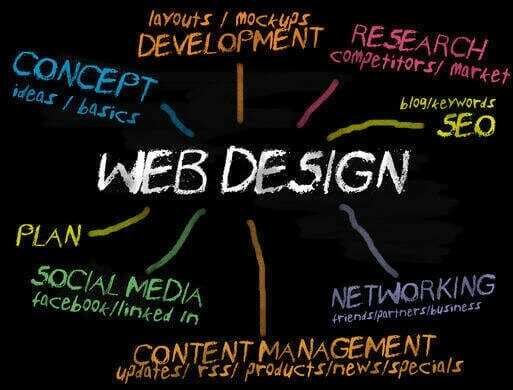 At Imagine Monkey, we’re experts at optimizing websites. 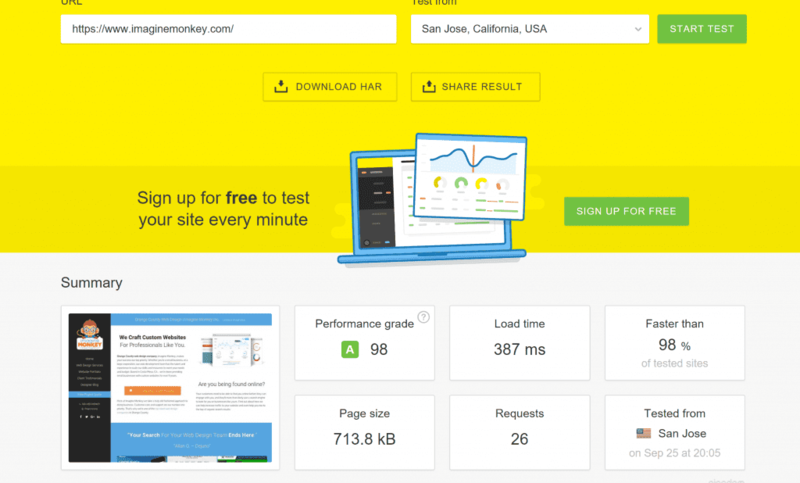 On website speed tests, our homepage loads in 323 milliseconds. When Google encourages sites to load in two seconds or less, we scream past the competition. Contact us to find out how we can increase your site’s traffic and help you rise to the top of search engine results.